I’ve been on a decluttering mission – diet, house, activities, car, clothing, digital life for about the past year. This mission has included a new consideration – will your homeschool curriculum travel well? I’ll tell you how I got here and then share how you can add this consideration to your curriculum choices for your upcoming homeschool year. We are going on the road! I’m so, so excited about our new adventure. My husband has been deployed in some form or fashion for much of the past two years. He’s not military, but he serves people who’ve lived through disasters. A very kind woman called his work as an insurance adjuster a ministry – and it truly is. He really helps people figure out what it takes to rebuild their lives. He’s been in North Carolina for almost 8 months working the aftermath of Hurricane Florence. A Big Transition for Our Family – Nomads! Anyway, I’ve stayed behind in an attempt to give our kids a somewhat “normal” life. I went into this thinking that plugging into a community – church, homeschool co-op, extracurricular activities – would make the daddy gap somewhat less. We didn’t really know what the job was going to look like, but wisdom comes on the other side of the struggle. The past two years have been a personal struggle for me – I’ve been trying to balance what everyone else needs and overlooking what I need. I needed to get to a place of being ok with my kids having a different sort of life and figuring out what I wanted to do. And after deep thought, and deep prayer, I’ve decided that it makes sense for us to hit the road. Yes, it’s a sacrifice for everyone, but it means our family is together. And that’s always been my foundation. Home is where my people are. Plus, we’ve gotten little glimpses of what it’s like to travel and plant for a time. We have had so much fun exploring our amazing country. I’ve been on a major decluttering mission for the past several months. People think I’m crazy because I’m constantly giving things away. But one of the ways I minister to others is to give away what has blessed us in some way. I lost my home to a fire as a teen. I’ve never forgotten the generosity of the people who led me to the Lord. So, now that you know my crazy mission – less stuff – and a need for homeschool curriculum to travel well, what’s a mom who loves to teach to do? How do you give kids a literature-rich, living education without all the books, binders, paper and supplies? Will Your Homeschool Curriculum Travel Well? I’ve been asking this question of every curriculum I’ve looked at of late. Will it travel well? Is it possible to do without the teacher text? I like teacher manuals, but I often get a look at what’s involved and then only work with the student book. So, if the student/teacher book is combined, that’s saving space in my book. It also makes assigning independent work a breeze. Is there an online version? I love, love, love Beast Academy because it is all online. The books, the videos, the problems – it’s all on the computer and it’s reasonably priced. I also love that All About Reading and All About Spelling have moved the tiles to an app format. We were always misplacing the tiles. I can take my teacher book, a reader, and the handful of pages from the activity book in my backpack. Is there a PDF version we can print on demand? I love to make single binders of work for my kids when we travel. If I can print a couple weeks’ lessons at a time, I can make a binder of work to take with us as we do school on the road. Can we find an audiobook, ebook or video to support the topic? If we can find the resource on one of our apps/websites, (Scribd, Epic, SchoolhouseTeachers) we use it. It saves space and is always on hand. We adore the “Read to Me” feature on Epic. Can we get the necessary books at a library nearby? We haven’t done this yet, but I’d love to check it out. One of our plans is to take school to the library wherever we’re traveling. I’m excited to investigate homeschool curriculum that travels well for our upcoming year on the road. 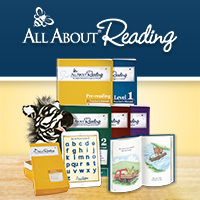 I’ll share a post soon about our homeschool resources that travel well. What do you do to minimize all the things in your homeschool?